“The housing affordability issue is becoming a crisis." 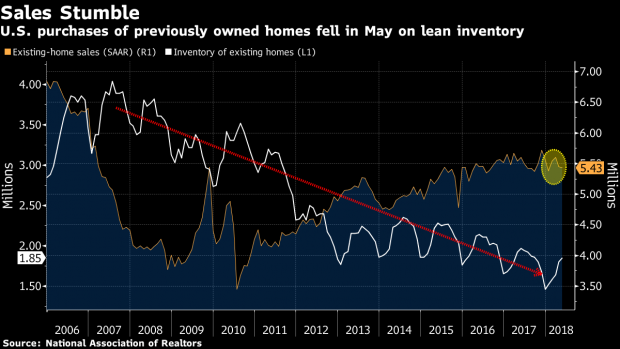 Sales of previously owned U.S. homes unexpectedly fell in May for a second month as a lack of inventory and elevated asking prices weighed on demand, National Association of Realtors data showed Wednesday. Contract closings declined 0.4% m/m to 5.43m annual rate (est. 5.52m), from revised 5.45m (prev. 5.46m). Median sales price increased 4.9% y/y to a record $264,800 Inventory of available properties fell 6.1% y/y to 1.85m. The drop in sales was led by declines in purchases of single-family homes and cheaper properties, according to NAR, indicating that the market is being driven by those with higher income and financial assets. Purchases fell in three of four regions. NAR says it remains concerned about a limited supply of available properties that has pushed up housing prices, leaving buyers with fewer options. In May, homes were on the market for an average 26 days, matching last month as the fewest days in records to 2008, the group said.